The 47LM9600 has very impressive picture quality with saturated blacks and eye popping whites and brightness. This is due in part to the Nano full array local dimming but also the internal video board de-interlacing and processing. The TV is of course 1080P and we note that the beautiful screen panel with its low luster showed excellent color reproduction. One area that LG has not shied away from with these its LED offerings is side angle viewing quality in which it exceeds the other manufacturers. Contrast degrades slightly at around 35 degrees off center but much less than other LED TVs. One negative trait that we noticed is a slight edge blurring. Images are not as crisp at the edges once some of the annoying edge enhancement features are turned off. We do however recommend leaving the Sharpness setting on this TV at 70% to offset the issue. Black levels are excellent on the LM9600 as evidenced by the top and bottom black bars framing 16:9 images. They appear inky and rich and do a good job of not oversaturating dark shadow detail. LG has really attacked the advertising hard with their 3D Cinema claims. Their campaign reads that, "In 3D tests, 4 out of 5 people choose LG Cinema 3D over Samsung and Sony for best color." Well first will say that in our testing of the LM9600 LG's 3D color was very good. It's got a nice realism to it. Color hues are very nice in both 3D and non-3D. I will even go as far as to say they look better than Sony or Samsungs. But color is only one component of testing. Image edges are, as stated, fuzzier with the LG picture image with or without 3D. There is a softness to the picture that is not crisp. And depth appearance with 3D signals is not as significant – all very important aspects of 3D picture quality. The 3D passive imagery is good in our opinion, just dont be fooled by a partially misleading claim. LG uses a scanning backlight technology in the 47LM9600 along with local dimming to create a faster refresh rate of 480Hz by using a superfast on and off sequence in the LED backlight. This is combined with the 240Hz rate of the TV to enable the TV to test much faster in fast motion image tests. That's the ultimate benefit of a faster refresh rate – perceived or real. It smooths out side to side panning and it takes away motion blur from fast moving or rapidly changing images. LG has some of the best calibrated picture settings in the TV arena. We found the Standard picture setting on the 47LM9600 very tough to compete with even with our calibrated picture settings. This is especially true of lowly standard definition picture images, so we do not hesitate to recommend this setting especially for brightly lit rooms with lots of incoming ambient light. The 47LM9600 receives the ultra thin 5mm or .2" bezel width for the minimalist modern look that today's manufacturers strive for. Why do we need OLED TV technology when the screens are already getting this thin without OLEDs? Anyway, all you see is what's on the screen which is cool. As well, the frame of the TV is virtually invisible – almost non-existent to the eye. It's built to optimize the TVs screen image while giving it a window type effect. 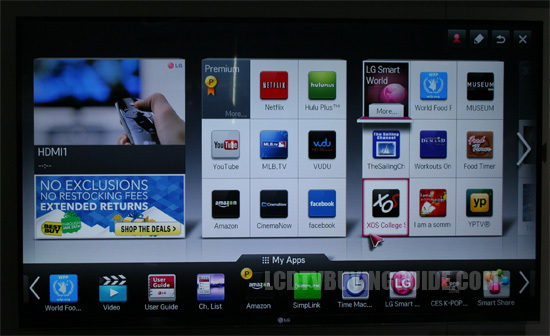 LG touts its Smart TV function in the LM9600 as being a crowd favorite. It is very complete and getting better. But essentially it offers about the same options as most other TV companies such as Netflix, Hulu Plus, YouTube, MLB.tv, social networking site hookup to Facebook and Twitter, and lots of kitschy little Apps like Boing, Boing, Fruit Puzzle, Paint, Agent Sudoku to name just a few. The viewer can see their current screen programming in a small upper left window while viewing the Internet TV choices. Included in the LM9600 is a full web browser which is one of our favorite features in today's TVs. It's not only useful to be able to watch free programming, but also to do rapid searches of the web for various things when you thing of them (while watching the TV). You never have to leave the couch. The magic motion remote control makes search much faster and easier. One area where the LG 47LM9600 has the competition beat is its impressive and fun-to-use Magic Wand Remote control which enables users to point and drag the curser before clicking to make selections. This speeds up on-screen keyboard typing on the 3D compatible LG TVs considerably. The main benefit is when web browsing, but it also helps with Apps. 2012 adds the new voice recognition function to the remote control as well though it does not speed up typing or browsing like the point and drag function does. When 2 people play a game in the same room on the same TV they are oftne forced to use split screen, the TV screen is split in half horizontally or vertically and each player not only gets a smaller view of the game, sometimes important screen area is cut off. LG's Dual Play technology utilizes the Cinema 3D to display both screens at the same time on the whole screen. Each player wears a different set of polarized glasses and only sees their game on the full screen. This is a huge upgrade from only looking at part of the screen.